They say salt water can cure anything, and a week of catching waves, chilling on the beach, and toasting the sunset at one of the most iconic surf locations in the world and the home of the perfect wave is definitely an antidote for the stresses of daily life or simply a recipe to have the time of your life. 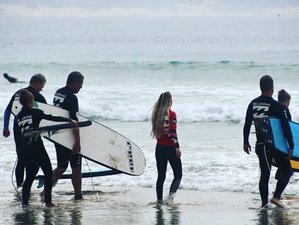 Soak up the sunshine, enjoy the relaxed atmosphere, and let Son Surf School take you there, Jeffreys Bay, the place of dreaming! Aloe Again Beach Accommodation has the most desirable address - Pepper Street. This places you only 50 meters and a minute walk from the world famous Supertubes surf break. SPAR food store is a four-minute walk from the property, while St Francis Bay is 28 kilometers away. The nearest airport is Port Elizabeth International Airport (PLZ), which is 85 kilometers away and approximately 45 minutes' drive. This laid-back self-catering house feels like a home away from home. It offers eight basic twin, double, and family en-suite rooms that are serviced daily. All rooms come standard with linen and bath towels, and a private bathroom with free toiletries. All units feature a wardrobe. There is DStv Select in each room as well as in the communal lounge. Among the facilities of this property are a restaurant, a shared kitchen and a shared lounge, along with free Wi-Fi throughout the property. An open plan kitchen, lounge, and entertainment area (featuring a pool table and indoor braai) invite you to kick back and take in the ocean air while you mingle with other guests. The back garden has an awesome fire pit which serves as the ideal place to meet new people and forge bonds of friendship that will draw you back to the bay time and time again. It also offers a terrace and you can play billiards at the accommodation. Bike hire is also available. Do as much, or as little, as you like here. Never caught a wave before? No problem - you don't have to be a surfer to join this camp, but Son Surf School can and will gladly help you become one. The coaching protocols are comprehensive and they cater for all levels and abilities - beginner, intermediate, and advanced. The instructors (ISA and SSA-accredited) will teach you everything from guided tours to catching your first wave, surf etiquette, water safety, video analysis, and much more. The reason Son Surf School starts off with beginner surfers on longboards is because they are easier. The longer and wider a surfboard, the more stable and forgiving it is. It will, however, be more tricky to carry and turn. As your skills improve, you will be able to ride a smaller board. After one lesson, your feet should have touched the board for at least two seconds. Each person has their own skill level and depending on fitness, age, flexibility, mindset and what you ate for dinner the night before, so you will achieve different results. Most people will stand in their first lesson, others take two or three. Few people stand on their very first wave. The most important thing is that you have fun and don’t hurt yourself. Son Surf School will do their best to instruct, motivate, and encourage you to surf your best from the very beginning. Coaching for the advanced surfer includes filming, video analysis, and contest strategy. Son Surf School provides surfboards and wetsuits as a part of the lesson at no extra cost. They have a wide range to choose from so you don’t have to worry about bringing your own. They also cater for all shapes, ages, and sizes. Children and teenagers are 100% welcome (Son Surf School is very family oriented hence they wish to cater for family groups) - they have experience with children as young as 4 years old. That would be their youngest age (4 years old) as far as the surfing program is concerned. However, they can customise a package especially for for a family or a group, for example, 4 people but only 3 will be part of the surfing program. Son Surf School will discount the package accordingly as there is one less person learning to surf (whether they are too young or other reasons). This excursion departs from Port St Francis, the main hub of South Africa’s calamari fisheries. Out into the bay, you will cruise up the coast taking in the beauty of the scenic reserve, sand dunes, and beaches along the way. August through to November, they experience a high success rate providing close encounters with Southern right and humpback whales who visit the waters on their annual migration south. They can often be seen putting on a spectacular show swimming with the numerous pods of dolphin who reside here year round along with penguins, seals, and a variety of other bird and marine life. Trips are an hour and a quarter in length and can be enjoyed by anyone keen on an outstanding marine experience. Party and corporate cruises are also available on request and are tailored to suit. If it is elephants you want to see, then head to Addo Elephant Park. Now South Africa's third largest national reserve, Addo Elephant National Park lies in the malaria-free Sundays River valley in the Eastern Cape, just over an hour's drive from Port Elizabeth and nine hours drive from Cape Town (817 kilometers). The park stretches from the semi-arid karoo of the north, over the Zuurberg Mountains and down through the Sundays River valley to the coast, to between the mouths of the Sundays and Bushman's rivers. Addo is home to one of the densest African Elephant populations on earth, roughly 550 of them. They once roamed the entire continent. By 1979, there were only 1.3 million African elephants left, and in 1989 they were added to the international list of the most endangered species, with only sixteen left in the Greater Addo area. More recently the Addo Elephant National Park has expanded to become the only park in the world to lay claim to Africa's 'Big 7' - elephant, rhino, lion, buffalo, leopard, southern right whale, and great white shark. It has done this by expanding along the coast from the Sundays River mouth towards Alexandria, and by adding an offshore marine reserve that includes St Croix Island and Bird Island, both essential breeding grounds for penguins and gannets. St Croix has the largest African penguin colony in the world. Kelvin Zemhke is a surf instructor. This surf camp will take place in Jeffreys Bay, South Africa. Jeffreys Bay is one of the most idyllic and learner-friendly surfing locations in the country. A host of some of the best waves in the world awaits you - up to 10 world class breaks and of course, Jeffreys Bay is home of the best right-hand surf break in the world! Ranked number six on World Surf League, international surfers flock to catch the legendary waves in this, a paradise of sunshine, aloes, dolphins, shells, perfect points, and classic reefs. Surfers and others who found it hard to leave such an idyllic spot have turned Jeffreys Bay into a year-round fun place to be, creating a thriving local craft industry besides the surf shops on just about every corner. The wave is not too powerful, so it's perfect to begin on. There are no rocks or reef to hurt yourself on. There are no strong rips. When the wind blows, strong side currents do occurs, so it's always good to keep a beach marker and move back to that when veering off too far. Beach access is easy with lots of open parking. Jeffreys Bay is a short drive from Port Elizabeth (75 kilometers). During this camp, you will only be served breakfasts. However, Jeffreys Bay has an awesome selection of restaurants, coffee shops, local craft beers, and proudly South African chow! There are Nina's Real Food, InFood Bakery & Deli, J-Bay Bru Co, Kitchen Windows Beach Restaurant, just to name a few. You can visit the rehabilitation center for free in Cape St. Francis. On a tour of Tsitsikamma National Park, you will walk through an old 800-year-old forest of endemic endemic yellowwood trees. You will explore diverse coastlines and hit the array of hiking trails. The park is home to numerous mammals, reptiles, and vast amount of different bird species, including the very rare Tauraco and sunbird. Meanwhile, numerous amenities including restaurants, chalets, shops, campsites, and adventure tour operators ensure a comfortable and versatile trip to sitsikamma National Park. Please book your flight to arrive at Port Elizabeth International Airport (PLZ). Pickup from Port Elizabeth International Airport (PLZ) is included in the package. Airport: Port Elizabeth Airport Airport transfer included: Port Elizabeth Airport No additional charges. You can request this in the next step. Son Surf School provides authentic unsurpassed surfing experience in JBay for all ages from beginner to advanced.